A dirigible balloon, run by foot power with bicycle drive, is being built by a Vermont inventor. Mail Box in which the writers inquire as to the possibility of constructing a small dirigible balloon which can be operated by man power. 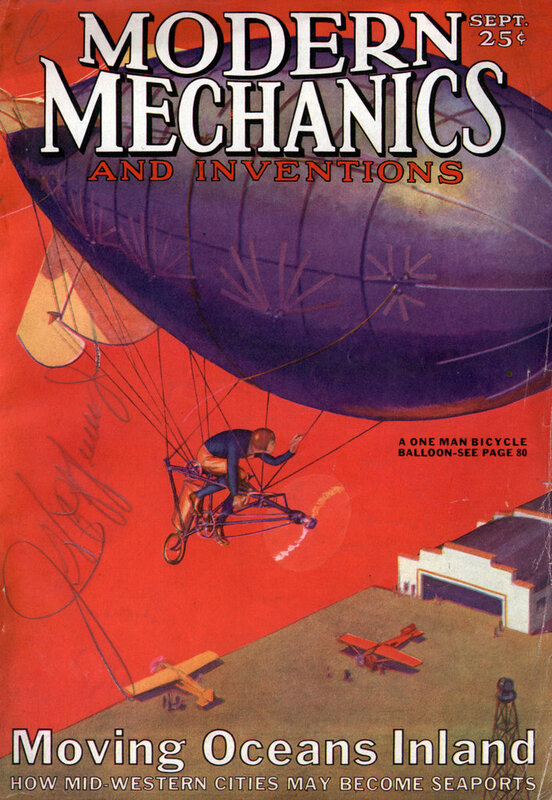 A dirigible powered with a bicycle, as depicted in the drawing above and as shown on the cover of the magazine this month, is under process of construction by Ray Fraser, of Brattleboro, Vermont. As planned by Mr. Fraser, the bag of his balloon will be 30 feet long by 15 feet in diameter. The bicycle power plant is to be suspended beneath the bag, the pedals being connected by a chain drive to a propeller which, it is estimated, will drive the craft at a speed of about ten miles an hour. Steering rudders of the ship will be operated by bicycle handlebars, while the elevators will be manipulated by a small wheel at the rear of the pilot’s seat. Although the idea of a tiny dirigible such as this is an appealing one, the item of cost will make such a ship impracticable for the amateur aeronaut. The bag must be filled with expensive gas and a suitable hangar must be erected to protect the ship from the weather. Furthermore, the cost of shaping the bag from rubberized fabric and attaching the working parts would run the initial cost of the dirigible to approximately $10,000. The ship could be flown only in calm weather, since the 10 mile an hour speed would leave it helpless in a modest breeze. The addition of a motor would, of course, increase the speed, but it would also require an increase in the gas bag volume of at least fifty per cent. 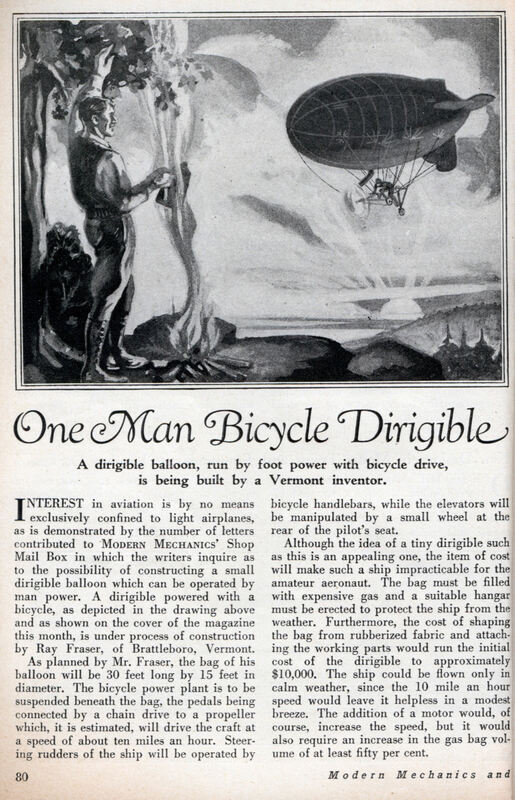 Mr. Fraser’s inspiration for his bicycle balloon perhaps was derived from a study of the world’s smallest dirigible, shown in the photo above. It is a unique ship of two lobes, the rear of which acts like a jointed tail which can be moved to steer the ship. A four cylinder Henderson motorcycle engine is used for power, developing a speed of 20 miles an hour. Designed by Matthew Q. Corbett, the unusual craft weighs only 800 pounds complete and can carry a useful load of 500 pounds. Another aircraft which combines features of balloon and airplane is pictured below, the invention of E. Winter, of Fareham, England. It is a glider-like machine fitted with flapping wings which are intended to give it forward motion. Lifting power is supplied by a tank of hydrogen. Thus far, it has not been tested successfully.